Taylor, Sue, Russell Bowman, and David Morgan. A Breadth of Vision: The Ritz Collection. Milwaukee, Wisconsin: Milwaukee Art Museum, 1992, p. 39, 106, cat. 127, b/w illus. p. 39. Milwaukee Art Museum. The Expressionist Impulse: The Ritz Collection. Milwaukee, Wisconsin: Milwaukee Art Museum, 1987, p. 10, cat. 2, b/w illus. p. 23. Milwaukee Art Museum. Milwaukee Collects Prints. Milwaukee, Wisconsin: Milwaukee Art Museum, 1982, p. 11, cat. 3. 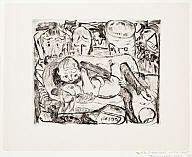 The Expressionist Impulse: The Ritz Collection, Milwaukee Art Museum, May 8 – September 13, 1987. Milwaukee Collects Prints, Milwaukee Art Museum, September 17, 1982 – January 2, 1983.